How to draw Jiraiya from Naruto Manga. 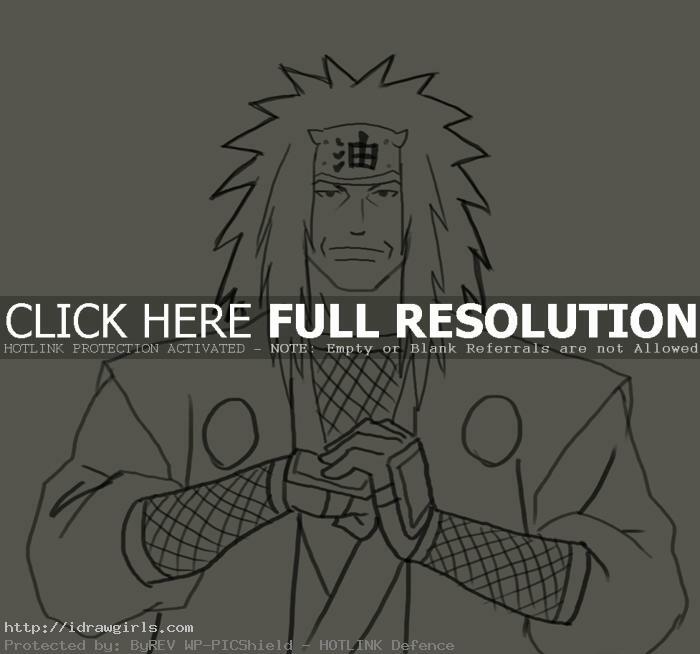 Learn how to draw Jiraiya Kiba from Naruto Manga series step by step basic Manga drawing lesson. Learn basic drawing technique for Manga, Anime and comics from TheArtClasses.com In this tutorial you will learn to draw an Manga character Jiraiya along with basic Manga drawing tips and technique. First, I usually start drawing with simple geometry shapes to construct the basic Manga head and body. This process will make your drawing process a lot easier. The intention is to get the shape and proportion right in the beginning. No matter what you are trying to draw, once you understand its foundation, you can keep drawing process at ease. You also have to make sure the shape of eyes, nose and mouth are correct and in the accurate spot. I usually start of using sphere or circle as a base for character’s head shape, then next step would be figuring out the next geometry form to fit into the image. Jiraiya was one of the legendary Sannin, along with Tsunade and Orochimaru, who was trained by the Third Hokage. He was a self-proclaimed super-pervert, and the writer of the popular adult fiction book series, called Icha Icha. He was also known as the Toad Sage. During the Second Shinobi World War, Jiraiya and his former team-mates fought Hanzō, the leader of Amegakure. Hanzō was so impressed that they could survive in a fight with him, that he bestowed upon them the title of Konoha’s “Legendary Three Ninja” (伝説の三忍, Densetsu no Sannin), and that they accept the title in exchange for letting them live. Here is a final drawing of Jiraiya. 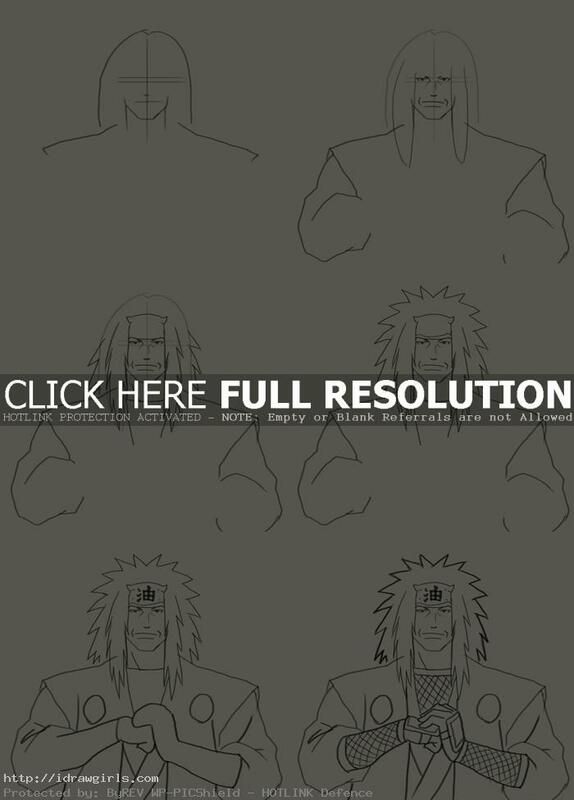 Below are step by step images how to draw Jiraiya. Step one, I rough out his basic head shape and shoulders. Step two, I drew his facial structure along the grids I previously laid out in step one. Also I made basic rough shape of his hair style. Step three, I add more detail to his hair style. Step four, I finished the rest of hair drawing. Step five, I then added his headband, kimono and sleeves. Step six, I finished the rest of his ninja outfit drawing and done. These are all awesome and very helpful, thanks! Can you, by any chance, draw Kakashi Hatake from Naruto too?